Plant: Summer growing, perennial, twining, legume with a deep swollen taproot. Stems: Twining, climbing, hairy, with older stems becoming woody at the base of the plant; capable of rooting at the nodes. Leaves: Trifoliate, dark green and slightly hairy on the upper surface, silvery and very hairy on the lower surface; lobes on the lateral leaves but not on the terminal leaf. Flowers: Deep purple with reddish tinge near base; groups of 6-12 flowers, often paired, borne on short stalks on a loose spike-like flower head or inflorescence, crowded at the apex; flower in late summer. Pods: Moderately long, hairy, cylindrical and tapering to a point; 12-13 seeds /pod; pods shatter explosively when mature. Used mainly for grazing in short term or permanent pastures with summer growing grasses. Combines well with tufted grasses. It can be made into hay, usually with a grass, although the twining habit can make harvesting difficult. It is also used for the re-vegetation/stabilisation of earthworks in cuttings and on embankments. Sown in areas with rainfall between 700-1,500 mm/ann. Leaf disease can be a problem in higher rainfall environments. It is relatively drought resistant, possessing a deep taproot and an ability to minimise evapo-transpiration through its hairy leaves. Is adapted to a wide range of soils from friable sandy to clay soils including cracking clays in a wide pH range between 4.5-8 (water). It performs best in moderately fertile, friable soils, but responds to fertiliser, particularly P, S and Mo on poorer soils. It declines rapidly in hard-setting soils. It is intolerant of flooding or waterlogging. Grows best in the subtropics and higher altitude tropics with day temperatures of 27-30ºC; growth is poor below 18ºC. Leaves are burnt by light frost. More severe frosts kill the plant back to the crowns, but plants recover with the onset of warm, moist conditions. Grasses: Best with tufted, summer growing grass species including the Carbon Buster™ guinea mix, Floren bluegrass, Swann forest bluegrass, Saraji sabigrass, Strickland fingergrass, panics, Setaria spp including purple pigeon grass, digit grass, buffel grass. 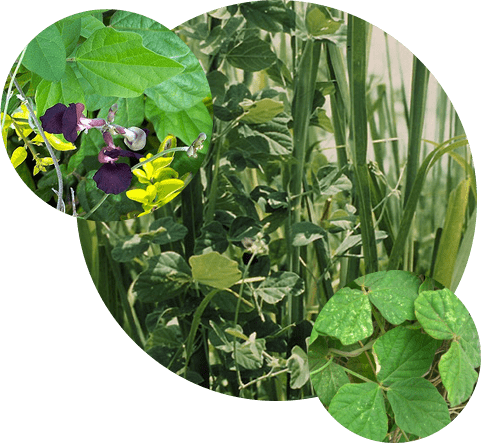 Legumes: Carbon Buster™stylo, Wynn cassia, green leaf desmodium, Glycine, fine stem stylo, carrabean stylo, shrubby stylo and caatinga stylo. Seed is sown at 1-2 kg/ha into a well-prepared seedbed. Sow at a rate depending on the proportion in the mix. Phosphorus may be required at establishment (20-30 kg/ha P) on soils with less than 8 ppm P according to soil test. The need for other nutrients, particularly K and S, should be monitored by soil analysis or foliar deficiency symptoms. Siratro is responsive to molybdenum, requiring 100-200 g/ha Mo at establishment on low fertility soils where it is deficient. On low fertility soils where the deficiency has been established by b, a maintenance application of P at 10-20 kg/ha/yr and Mo at 100 g/ha every 4-5 years. Performs well under rotational grazing but not under set stocking where it declines rapidly. Very palatable and is selectively grazed. Spelling during flowering and seed set is essential for long-term persistence. This will maintain a good soil seed reserve and enable the recruitment of new plants. Seed pods shatter explosively, throwing seed for several metres. Seed can also be spread through water movement and in dung, following ingestion by cattle. It has no weed potential in grazed lands. However, in restricted areas, it is now considered a weed of ungrazed areas such as roadsides, waste land and gardens. It can also create problems in sugar cane paddocks where twining vines can interfere with mechanical harvesting. Susceptible to leaf rust, blight and spot. Susceptible to bentazone, 2,4-D and 2,4-DB. Nutritive value generally good, although crude protein, mineral content and digestibility can be increased by providing optimal levels of P, S and Mo. Crude protein varies from about 25% in young, leafy plant material to 12% in older material with a larger proportion of stem. Readily eaten by livestock; grazing pressure in continuously grazed pasture is the main reason for plant population decline. DM yields range between 5-10 t/ha/yr in better seasons; yields are lower in drier environments.